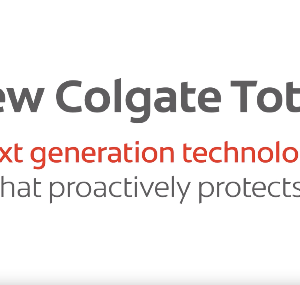 Whole Mouth Health: Colgate Total®, the world’s first multi-benefit toothpaste, has been re-invented to work with the biology and chemistry of the mouth for better oral health outcomes vs. non-antibacterial toothpaste. Decades of research have led to the development of a patented formulation for new Colgate Total®. Formulated with a proprietary combination of Dual-Zinc + Arginine, new Colgate Total® protects against bacteria in two ways. Decades of research have led to the development of a patented formulation for new Colgate Total®. This advanced toothpaste helps to achieve Whole Mouth Health with a new technology to provide pro-active protection to the whole mouth and to help prevent the most relevant oral diseases and conditions. It weakens to kill bacteria in plaque biofilms and saliva on hard and soft tissue by binding to them and interfering with their metabolism of nutrients, which is vital for survival and growth. It fortifies the soft tissue’s natural defense by building a protective barrier on the whole mouth. This helps shield soft and hard tissue against bacterial attachment and regrowth, preventing bacterial reservoirs from forming. This is important, as, immediately after brushing, bacteria quickly repopulate on 100% of mouth surfaces, consisting of hard (20%) and soft tissues (80%). By brushing with new Colgate Total® twice daily, patients can actively fight bacteria on 100% of mouth surfaces for Whole Mouth Health. *1 Ordinary fluoride toothpastes** limit outcomes by only providing fluoride protection to 20% of the mouth as they do not fight bacteria. 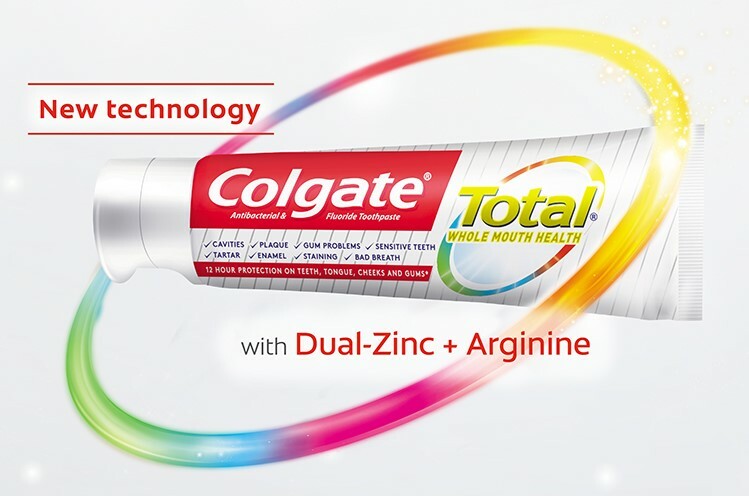 In addition to excellent plaque and gingivitis control, New Colgate Total® with Dual-Zinc + Arginine delivers comprehensive benefits for the whole mouth, including tartar and dentin hypersensitivity control, whitening/stain removal, fresh breath, cavity and enamel protection. People’s view of health has evolved since the launch of the original Colgate Total® more than 20 years ago. What had been a focus on avoiding disease and managing problems has become a desire for a holistic, preventive approach that enables a full and connected life. When it comes to toothpaste, patients are seeking reassurance that they’ve done the most complete job possible for the health of their whole mouth, enabling them to connect with the world around them. With new Colgate Total® people have an advanced single solution for a pro-active, more complete oral health***, delivered by a toothpaste with proven protection against bacteria on tongue, teeth, cheeks and gums. 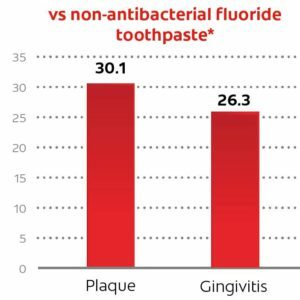 * Statistically significant greater reduction of cultivable bacteria on teeth, tongue, cheeks, and gums with Colgate Total® vs non-antibacterial fluoride toothpaste at 4 weeks, 12 hours after brushing. ** Defined as non-antibacterial toothpastes. *** Vs ordinary, non-antibacterial fluoride toothpastes. Posted in EduForum, We Care! and tagged 100% of mouth surfaces, cheeks, cheeks and gums, Colgate Total®, dentin hypersensitivity control, Dual-Zinc + Arginine, first multi-benefit toothpaste, gingivitis, gums, new Colgate Total®, Next Generation Toothpaste, non-antibacterial fluoride toothpaste, non-antibacterial toothpaste, plaque, plaque and gingivitis control, plaque biofilms, teeth, tongue. Bookmark the permalink.